When I was a child in the 70s, the United States was gearing up to switch from customary units to the metric system. 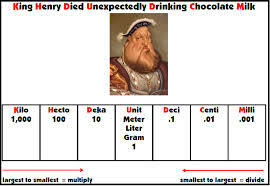 Consequently, we learned the metric system right along with standard units of measure. We also saw advertisements like this one on television: Sadly, the metric conversion never fully took place in the United States, and today’s students are still learning two systems of measurement; customary units (inches, feet, yards) as well as the metric system. 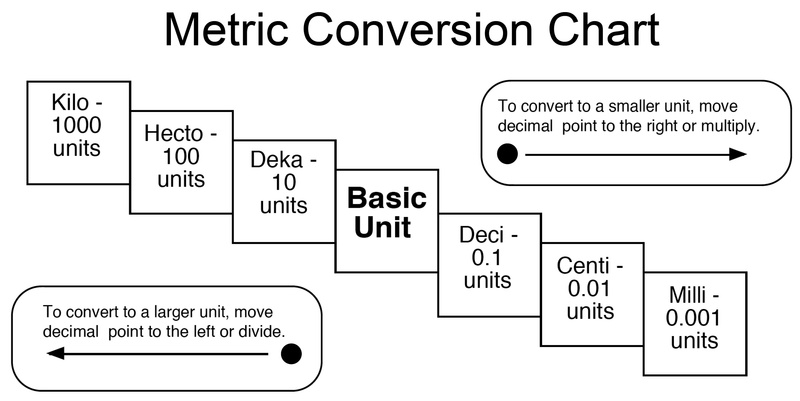 Personally, I have always found the customary units we use in the United States a bit cumbersome, especially when it is necessary to convert smaller units to larger units or vice versa. How much easier it is when using the metric system. So, if the metric system is so much easier to work with, why are we still filling our gas tanks with gallons of gas, rather than liters of gas? Driving miles instead of kilometers? Measuring height in feet and inches instead of centimeters? The reasons are many and have to do with politics, our history, expense, and plain old resistance to change. “That seemed about to change in 1971, when a U.S. National Bureau of Standards report titled “A Metric America” recommended that the U.S. transition to the metric system over the course of 10 years” (Harris, 2014). In 1975, Congress passed the Metric Conversion Act, but the act left it up to businesses and individuals to choose whether or not to convert. As a result, the move to switch to metric seemed to fizzle, leaving our country using a mishmash of measurements. Will the United States ever make the switch? Stay tuned! Try this quiz to see how you measure up! source: Harris, William. “Why isn\u0027t the U.S. on the metric system?” 04 October 2011. HowStuffWorks.com. 15 July 2014. While working as a paraprofessional in Alabama, I got to see how many different teachers at all elementary grade levels approached teaching math. 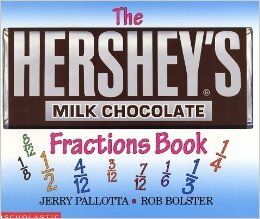 One of the teachers I worked with used the book, The Hershey’s Milk Chocolate Fractions Book, as a fun fraction activity with her students. The book covers the fractions 1/1 through 13/12. I have also used this book with second graders and the promise of getting a whole chocolate bar to eat at the end of the class is a powerful motivator for them to pay close attention. I like several things about using this book as a fun class activity. First, the students not only get a lesson in fractions, but they learn about where chocolate comes from, and what goes into a Hershey Bar. Also, the book does a wonderful job of explaining equivalent fractions such as 1/1 and 12/12 and comparing fractions, asking students, “Would you rather eat 1/12 of the candy bar or 11/12?” I also like how the book addresses the Piagetian concept of conservation, showing the twelve pieces of candy bar laid out in a grid and then stacked atop one another, showing that whether the pieces are spread out or stacked, you still have a whole candy bar. My experience as a paraprofessional coupled with my math struggle made me determined to help my own children really understand and experience math. Part of my strategy with my own children was to bake with them. We started with Easy Bake oven mixes, worked our way up to packaged cookie and cake mixes, and, finally, baking from scratch. I believe that doing this with my children was beneficial in that they learned a valuable life skill as well as how to read a recipe, how to measure liquid and dry ingredients accurately, and how to halve and double recipes. Now that my children are almost grown, all that practice in the kitchen has enabled me to modify recipes with ease. In order to avoid eating massive amounts of leftovers, I often opt to halve a recipe. My most recent modification was a blueberry cobbler recipe from Betty Crocker’s 40th Anniversary Edition Cookbook. Click the link for the original recipe. Math has never been my strong point and I have struggled with the subject from my earliest school days. 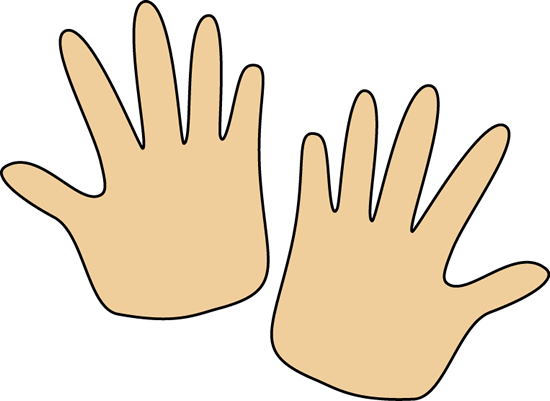 I remember as a kindergartener how we were discussing the fact that each of us has ten fingers. I remember vividly my belief that no, we do NOT have TEN fingers. In my little mind, the thumb was a thumb and therefore did not count as a finger. I firmly believed that we all have eight fingers and two thumbs! It was downhill from there. I remember as a first grader being confounded by addition and subtraction. In desperation one day my teacher gave me a box of counting bears and sent me to go and work on my worksheet. I had a great time sorting all the bears by color and counting them. I don’t think I ever got my work done that day. However, by the time fourth grade came around, I was really struggling. By the time we got around to working on fractions I was absolutely lost. Lowest common denominator, least common multiple, lowest terms—it was a disaster for me, and by the time I met the math requirement for graduation in high school, I was jubilant to not have to deal with math anymore. Becoming a paraprofessional or a teacher was not even a blip on my personal radar at the time. By 2006, I was the mother of two children, living in Alabama, and working as a paraprofessional at an elementary school. My assignment for the 2006-2007 school year was to work in a sixth grade homeroom class with several special needs students and provide assistance and support. Many of these students did not even know their multiplication tables and math was a struggle for them, especially the pre-algebra material that they were required to take. Fortunately, they had a talented veteran math teacher. She was wonderful, going through problems step by step, answering the students’ questions patiently, using visuals and manipulatives when appropriate. When we began covering fractions in class, though, many students were in over their heads. Together, we got through equivalent fractions, adding and subtracting fractions, but the day we began multiplying fractions, several students were confused and frustrated. Finally Mrs. H. called me to the front of the room and asked me if I would help her explain multiplying fractions. I came up, wondering what she had in mind. “Boys and girls,” said Mrs. H., “Now I want you to pay attention. I have a little rhyme that helps you to remember how to multiply fractions.” She asked me to stand beside her and she chanted, “Multiplying fractions is really no problem, It’s top times top,” (here we gently bumped heads) “and bottom times bottom,” (here we bumped hips). The class laughed at us for acting silly. But the mood in the room lightened considerably and the frustration level dropped as several of the students had their a-ha moment. That day was an a-ha moment for me as well. I realized that math can be fun, even for students who struggle in the subject. I also realized that it is all right to be a little silly at times in the classroom. I never forgot Mrs. H’s chant, and I have used it many times while working with students with fractions (minus the head bumps and hip bumps!). For more about multiplying fractions, check out the fabulous resources at Khan Academy. A recent assignment required me to research and come to some conclusions regarding Common Core. I was aware that Common Core is a hotly debated issue. After reading the assigned articles for class and doing my research, I began to understand why Common Core evokes such an impassioned response in almost everyone. In practically every article I read, the viewpoint seemed to be slanted one way or the other. 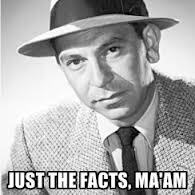 I found it difficult to find material that would simply give the facts. Upon reading the common core standards, however, I recognized that many of the standards are concepts that are already being taught in the classroom, even though Minnesota has adopted only the reading language arts standards, not the math standards. Whether Common Core will be the solution to get American students to the level of their peers in Shanghai, or a risky, expensive experiment with our students remains to be seen. However, as I mentioned in an earlier blog post, I think that removing people’s fear of math will go a long way toward helping our students succeed. In talking with friends and parents of children in school, I have heard more than one person tell me, “Math is different now than when I was in school.” I don’t think math is necessarily different. Even though math has never been my favorite subject, the one thing that I love about math is that in math, the rules are the rules. Period. However, I believe that the way math is taught is different than it used to be. I have watched my mentor use technology, manipulatives, and other strategies to meet the needs of her students, and as a visual learner myself, I applaud that math is being approached in what I believe is a far more “user friendly” manner. As I did my research, I found the following quiz that was published in the Washington Post. The quiz is a sampling of questions that students may be asked on their standardized tests. Try it! The results may surprise you. As part of Math 1510, the class examined different numeration systems and nondecimal positional systems. As I did my homework, I found myself becoming truly thankful for the Indo-Arabic numbering system that we use daily. I also marveled at the ingenuity of the Egyptians, Romans, Babylonians, and Mayans. 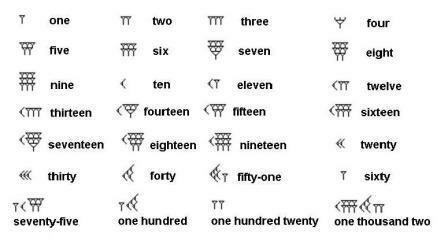 Although the numbering systems they used are cumbersome, these civilizations accomplished amazing things. Still, could you imagine trying to balance your checkbook using these symbols? Or even more challenging, trying to do business using the Babylonian system? My textbook stated that “…we humans come with a built-in “digital” calculator, as it were, with 10 convenient “keys” (fingers),” (Long, et.al, 2011, p. 127). Being so used to a base-ten number system, when I moved on to working problems in base five, base six and on up to base twelve, I definitely was stretching my brain. It also made me remember this Schoolhouse Rock video that used to air on Saturday morning television. After working several problems with different bases, it actually became fun—almost like a puzzle. I hope that in my future classroom that I can encourage my students and give them the “sticktoitiveness” to work through things that may not come easily to them and become proficient. My son has been involved in Scouting since he was in first grade. This was supposed to be an activity for him and my husband to do, but as The Boy Child has progressed through his Scouting career, Cub Scouts, and later Boy Scouts, have become a family affair. We have camped, organized and participated in the Pinewood Derby, and helped with service projects and fundraising events. One fundraising activity our local troop does is selling water and pop at our town’s annual summer festival, Timber Days. The Boy Child is now 17 and has a job, so that has decreased his availability to participate. My husband is busy with work, so that is how I ended up spending a sizable chunk of the past weekend sitting under a canopy in the rain. This gave me time to ponder this week’s work in Math for Elementary Teachers I; Venn diagrams and starting a math blog. 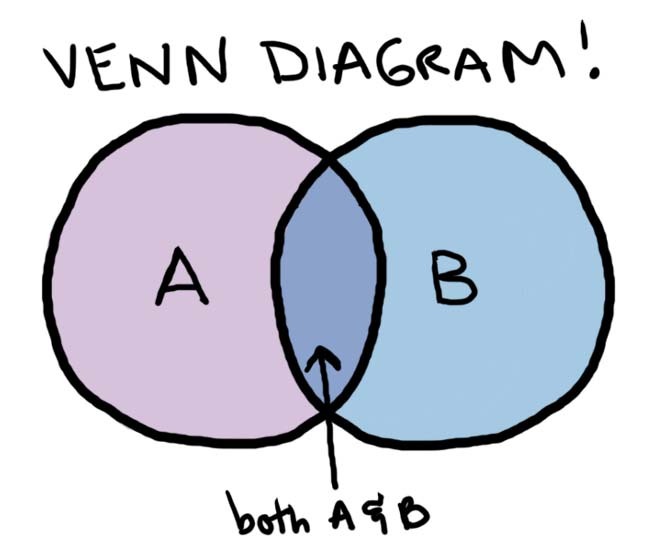 In class this week, I learned that Venn diagrams are a useful tool for working with sets in math. I am a visual learner and working with the diagrams in the e-text or drawing my own while solving the assigned exercises helped me to gain a good understanding of how Venn diagrams work. As I watched the boys sell pop and water (and cups of coffee when the weather turned foul), I thought of ways we could use Venn diagrams in our fundraising endeavor. A Venn diagram could illustrate what sold in the booth. When a customer came by as the boys were practicing the ubiquitous Boy Scout skill of knot-tying, and asked them, “What’s your favorite knot?” I envisioned a Venn diagram showing the different knots the Scouts learn and which one is the knot of choice for each member of the troop. Click to learn more about Venn diagrams. I am looking forward to more adventures with the Scouts in the next few months as The Boy Child works toward completing the requirements for becoming an Eagle Scout. I am also looking forward to learning more about math and writing about it as part of this class.